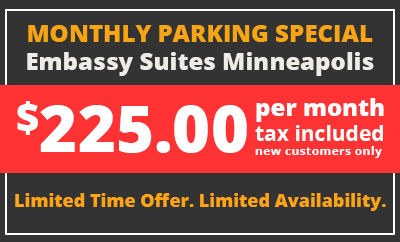 The Embassy Suites, located in the heart of downtown Minneapolis, is offering a limited-time monthly parking special of $225/month, a $50 savings! Ideal for commuters and residents, Embassy Suites is the perfect solution to your parking needs. Reserve monthly parking now and save! Please call us at 612-371-0938 if you have any questions.